“They want to see something special. Rick Estrin & The Nightcats— jaw-dropping guitarist Chris “Kid” Andersen, singing drummer (who plays standing up) J. Hansen and dynamic multi-instrumentalist Lorenzo Farrell (electric and acoustic bass, organ and Moog synthesizer)—serve up fresh and modern original blues injected with a solid dose of gritty roadhouse rock ‘n’ roll and Estrin’s trademark philosophical wiseguy humor. Since the 2009 release of their celebrated Alligator Records debut Twisted and the 2012 follow up One Wrong Turn, the band has toured non-stop, sharpening their musical telepathy to a razor’s edge. 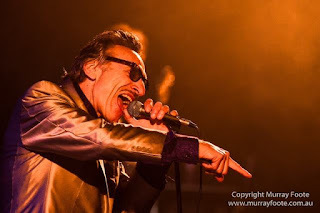 Estrin won the 1994 Blues Music Award for Song Of The Year for his composition “My Next Ex-Wife” and has written songs for a growing legion of other musicians. Three of his songs found their way onto Grammy-nominated albums: “Don’t Put Your Hands On Me” (on Koko Taylor’s Force Of Nature), “I’m Just Lucky That Way” (on Robert Cray’s Shame + A Sin), and “Homely Girl” (on John Hammond’s Trouble No More). Estrin cites Sonny Boy Williamson II, Percy Mayfield and Detroit bluesman Baby Boy Warren as his major songwriting influences. Besides Estrin’s streetwise songwriting and musical skills, he is among the most entertaining and colorful showmen around. His quick wit (as heard to great effect during the introductions to “My Next Ex-Wife” and “That’s Big”) and his signature look—coifed hair, pencil-thin mustache and sharply pressed, custom made suits—add even more color to his performances. Estrin was born in San Francisco, California in 1949, and grew up following his own path. He discovered an entirely new world when, as a 10-year-old boy, he made his way to the tough Market Street area and befriended many of the neighborhood characters. He had another revelation when his older sister gave him a copy of Ray Charles’ The Genius Sings The Blues when he was 12. Albums from Jimmy Reed, Champion Jack Dupree, Mose Allison, Nina Simone and others soon followed. By the time he was a teenager, Estrin had completely identified with the urban, African-American culture surrounding him. He got his first harmonica at age 15, and by age 18 was proficient enough to begin sitting in at black clubs around the city. He first jammed with blues master Lowell Fulson and almost immediately was hired to open five shows for R&B giant Z.Z. Hill. He worked five nights a week for almost a year with guitar legend Travis Phillips in a band fronted by famed pimp/bluesman Fillmore Slim (who was the centerpiece of the acclaimed Hughes Brothers documentaryAmerican Pimp). Slim introduced Estrin to Rodger Collins (“She’s Looking Good,” “Foxy Girls In Oakland”), the man who would become Rick’s first real musical mentor, and who schooled Rick on the finer points of songwriting and show business. Estrin moved to Chicago when he was 19 and worked with South Side bluesmen Johnny Young, Eddie Taylor, Sam Lay and Johnny Littlejohn before meeting and jamming with Muddy Waters, who told Rick, “You outta sight, boy! You got that sound, boy! You play like a man, boy!” In fact, Muddy wanted Estrin to go on the road with him, but due to nothing more than a missed phone call, it never happened. Rick eventually moved back to the Bay Area, met Charlie Baty and formed Little Charlie & The Nightcats. For more than 30 years and nine albums, Rick fronted the band, featuring Baty’s one-of-a-kind guitar acrobatics. The band won international acclaim and toured the world repeatedly. They were nominated four times for the prestigious Blues Music Award for Band Of The Year. With Charlie’s retirement from touring in 2008, Rick rededicated himself to his craft. Hansen and Farrell wanted to keep the band going. Estrin knew the only way to replace Baty’s crazed and unique guitar style was to find someone with an equally insane and individual approach, and he knew that would be a tall order to fill. As a testament to their talent, audiences at their performances are often peppered with musicians wanting to glean a lick from these dynamic musical masters. Fans ask to go home with a CD that reflects what they just witnessed. 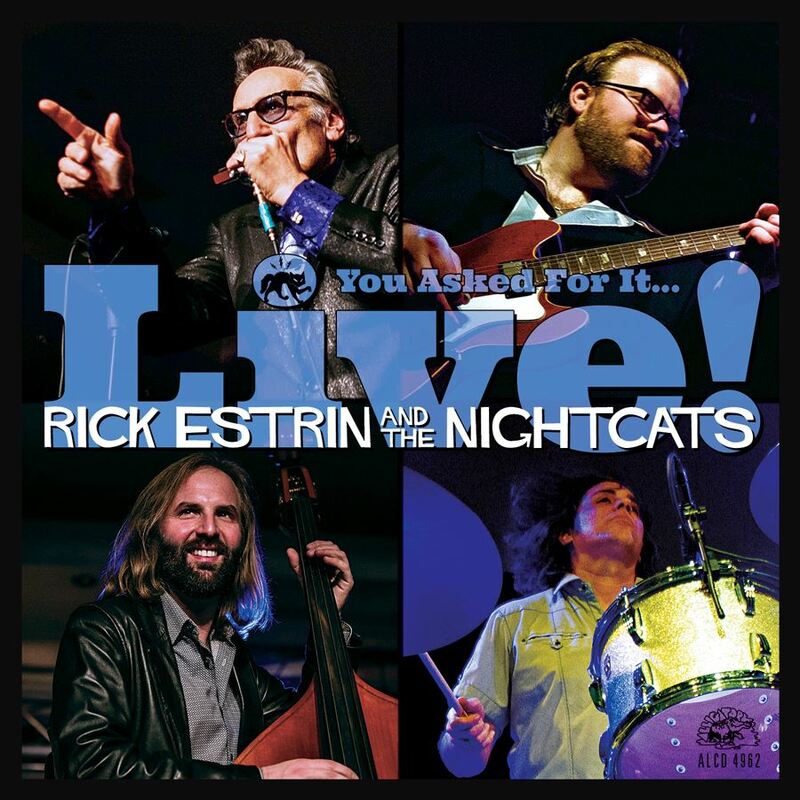 Now, with You Asked For It…Live!, Rick Estrin & The Nightcats can satisfy their fans’ demands. Estrin recalls, “After shows, people are always asking, ’Are any of these CDs live? Which of your CDs is most like what you did tonight?’ Now, I can tell them, ‘This one right here. Thank you. We’ll be happy to sign it.’. 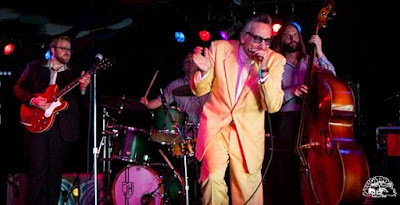 CLICK HERE to learn more about RICK ESTRIN and the NIGHTCATS. CLICK HERE to visit the performers website.